Google's nifty Chromecast dongle may be getting some competition from a similar device powered by Mozilla's Firefox OS. 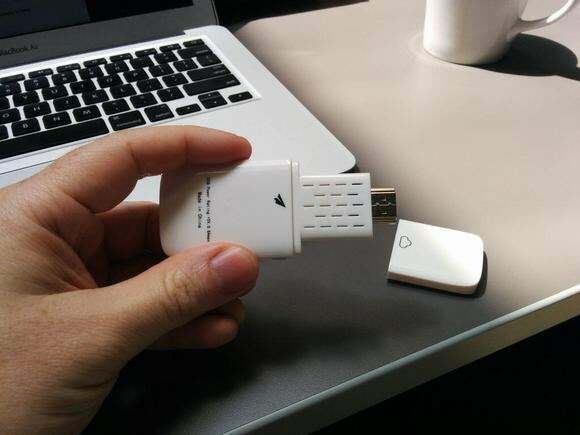 On Thursday, Mozilla developer evangelist Christian Heilmann tweeted an image of a TV casting dongle loaded with Firefox OS. Heilmann's tweet was followed on Friday by a short video from GigaOm showing the Firefox OS dongle in action. It's not clear what company is developing the device or when it would go on sale. This is not a Mozilla project, and we do not make devices. Firefox OS is an open platform freely available for any company to build on without restrictions. This means companies can experiment with different form factors that run Firefox OS. Presumably, however, the company developing the device would want to include Mozilla Firefox branding, which would at the very least require the browser maker's blessing. Similar to Chromecast, the Firefox OS dongle would let you send video streams from a mobile device to the TV casting device. The dongle would then stream the video itself and the mobile device would be used as a remote control for content displayed on the TV. Although the product hasn't been announced, the anonymous company appears to be using the word "fling" instead of cast. Which, in a sense, is a more descriptive way to explain what you're doing when you move content from your mobile device to a television. That terminology could change before the Firefox OS device makes a public debut, however. Interestingly, the Firefox OS dongle is compatible with a limited number of Cast-enabled apps—at least on Android—including YouTube and Google Play Music, according to GigaOM. Chromecast compatibility would make it easier for FirefoxOS-based casting devices since developers would presumably have to build casting/flinging capability into their mobile apps. The only alternative would be for users to cast/fling everything they do via Firefox for Android. A pre-release version of Firefox video casting from earlier in June. Mozilla has been working on casting for Firefox for Android. In early June, nightly builds of Mozilla's mobile browser were released with the ability to cast HTML5 video encoded as H.264 to a Roku box, Mozilla developer Mark Finkle wrote on his personal blog. Mozilla plans to make casting compatible with other video encodings in the future. Finkle had previously shared an image of Firefox tab mirroring in September on Google+.